The dining room is one of my favorite places to be with family & friends. Those walls have embraced lots of love, laughter, and even tears over the years. You might argue that most dining rooms are only used on holidays and special occasions, but it’s not a room I would give up. Do consider a round dining table. If you have a room that is more square; round can be great for conversations. The new styles have some creative solutions to expand for larger parties. Do place an area rug under the table, whether you have hardwood or carpet, it can really bring a room together. Make sure it’s big enough so that chairs are fully on the rug when seated and when the table is fully extended. Don’t get a a light fixture that is too small or large for the scale of the table and room. A rule of thumb is to choose a chandelier with a diameter that is 12″ less than the width of the table. Hang it approximately 30-34″ from the top of the table. If your ceilings are higher, add 3″ for each foot over 8′. Personally, I like to go lower than higher. Just make sure you can clearly see your guests across the table and that you don’t see any exposed bulbs when standing if it is a chandelier with indirect lighting. Don’t forget the ceiling. 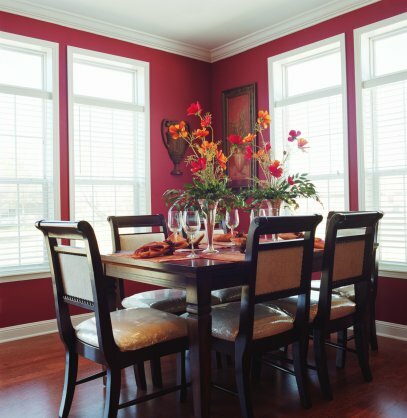 Add interest with color, faux painting or a fabulous medallion above the chandelier. Don’t hang pictures too high. The majority of time spent in this room is while seated, so make sure that when sitting, the art is hung at eye level. Don’t be afraid to mix and match chairs, fabric, and even China; it can give an interesting flair to the room. Especially, if there is a story behind the china. Finally, embrace your new Dining Room. Why is it only used for dinner parties and holiday get togethers? Break away from habit and occasionally share a candle lit dinner with that special someone or make the kids feel really special with dinner and candles just “because”. Have any other tips? We’d love to hear from you! Creating A Room for Everyone! Planning a space such as a family room or great room, requires some extra thought since it’s a room that will be used by lots of people and for a variety of different activities. The goal is to make this space both functional and beautiful, which is easy if you take a few minutes to plan before you begin. Will TV be watched in this area? Do you need seating for entertainment? Will you ever eat in this room? Is there alot of traffic in and out? Is someone going to read or study here? Is there often more than one activity going on at the same time? If you answered yes to most of these, you’ll need to design a room accordingly, but it can be fairly simple to do. Here are some suggestions for creating a space that is not only provides flexibility, but that could end being a favorite room for everyone! Create several seating areas. If space allows, create a larger seating area for a main gathering such as watching a movie together or entertaining guests and then place one or two other seating areas around the room for reading, one-on-one conversations, or even a game of backgammon. Plan for extra guests by placing 2 ottomans under a sofa table or in front of a fireplace the can pulled into the main seating area and place an extra chair next to a desk that can used as well. You may want to include a multi-purpose table and chairs that can used for cards, crafts, gift wrapping, eating, or appetizers when entertaining. Fabrics and finishes should be chosen not only for beauty, but durability. It is possible to have both! Don’t forget about lighting. Of course you need overall lighting for the whole room, but by adding a flood lamp behind a floor plant, a beautiful reading lamp next to a favorite chair, and candles on table tops; you can create instant ambiance. Tip: I love dimmers! They are easy to install and in a second you can take a room from bright to romantic. Try them in every room of the house! Use pieces that can used for several purposes. For example; an ottomon can be used as a coffee table. Look for one that is firm enough for a tray of drinks, durable enough for your feet, and has a hinged top that will store games and comfy throws. Another great piece to look for is a set of nesting tables that can be neatly stacked for daily use, but split when entertaining. The key to designing a successful “living” space that works for everyone in your home, is to simply taking a few minutes to evaluate the lifestyles of everyone who lives there and to use items and materials that are not only beautiful, but functional for any occasion. With a few minutes of extra planning, your room is guaranteed to become a favorite place to be – and the keeper of many happy memories with family and friends.